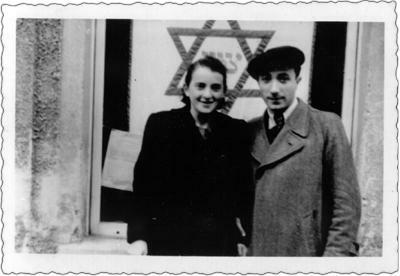 Holocaust Survivors: Photo Gallery - "Under the Star of David"
Joseph and Rachel Sher stand in front of a Star of David at the Jewish Community Center in the DP campDP camp at Neunburg vorm Wald. The Star of David is also called the Magen David or Shield of David. The symbol was associated with Kabbalah or Jewish mysticism in the 13th century. In the 17th century it was adopted as the symbol of the Jewish community of Prague. In the late 19th century it was used by Zionist groups, and in 1949 it was placed on the flag of Israel.